As parents, the safety of our children is the main concern always on our mind. With October recognized as National Window Covering Safety Month, here at 3 Blind Mice, we feel there is no better time to assess the safety of your home and upgrade your window treatments for your child’s safety. Keeping your child safe means more than telling them to look both ways before crossing the street, your home can be a danger as well. 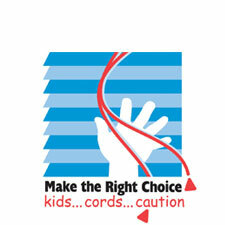 In 74.8% of strangulation accidents with children, horizontal and vertical blinds have been involved. In this post, we are going to explore the common dangers and hazards of window treatments as well as provide a few of the best steps to take in order to reduce those dangers. We also want to offer our personal recommendations of child safety window treatments that can be used to replace existing blinds, shades, or drapes that do not have child safety control features. As you can see in the ABC News segment above, pull cords on window coverings can be extremely dangerous in your home and are not a danger of the past. The mother was in the room with her son and it only took a moment of distraction for the accident to happen. Most people aren’t even aware of the hidden danger in their home. This is why we are raising awareness and advocating to go cordless. With every new product, the window coverings industry is moving more and more away from pull cords to help reduce strangulation incidents like this. Please join the movement and go cordless. Interested in learning more about window coverings safety? Download our guide on child and pet safe window treatments to discover all of the hazard free options available. U.S. Consumer Product Safety Commission (CPSC) staff estimates that from 1996 to 2012, children received treatment for 1,590 injuries. 49% of window covering strangulations go unreported according to USCPSC. According to CPSC, 571 cases of strangulation have occurred since 1986. 40% involved continuous loop systems typical to vertical blinds and draperies. Among the patients who were dead on arrival or died in the emergency department, 65% were 5-year-olds and 35% were 3-year-olds. How Can We Protect Our Children and Pets? Go cord-free! Every style, product, and design of corded window treatments can be found in a child safe cordless fashion, and nearly all of our window coverings can be motorized. We carry a variety of non-corded alternatives such as roller shades, wood and vinyl shutters, curtains and motorized blinds & shades. We also recently added a new child safe product to our portfolio the Aloha Shades. 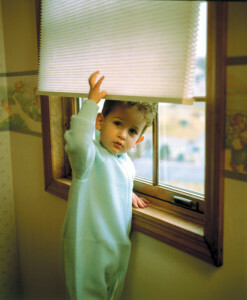 Upgrade to cordless or cord-free child safe window treatments. Keep a safe distance between cribs, beds, and climbable surfaces from your windows. Tie or place window cords away from the reach of children. Install motorized and child safe window treatments. Stay up to date on what’s happening on Twitter with #GoCordless and #DeadlyDelay. View this video playlist exploring more of our recommended child safe window treatments including a variety of cord-free & motorized systems.